Judging by the various levels of arguably aggressive celebrity reactions, paparazzi must be beyond bearable at times. For Brad Garrett, smacking cameras out of a photographer’s hands was effective. Back in 2004, Cameron Diaz decided to grab a camera and run away with it. Jennifer Lawrence would rather flip the camera off when goaded past endurance. And Britney Spears attacked a paparazzo's unoccupied truck with an umbrella during the infamous bald rampage of 2007. Celebrities often lose their temper when dealing with the ever-present picture-taking, but a new philanthropic response may work wonders. 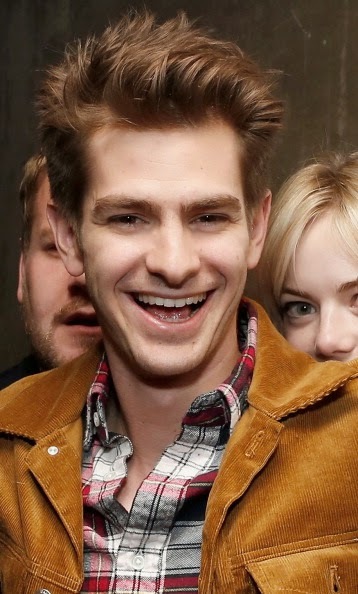 After lunch, early Tuesday afternoon, June 17, at Café Cluney in New York City, avid photographers ambushed the “super” power-couple Emma Stone and Andrew Garfield. Fortunately, they were ready to make a statement. The deliciously adorable couple sent a message loud and clear to the paparazzi. The message promoted the service and generosity one might expect from the Amazing Spider-Man himself. Emma and Andrew adopted the idea again Tuesday. They left the restaurant silently, but holding signs over their faces, handwritten themselves, to raise awareness for two of their old-favorite charities, and two additional ones. This time, the signs were on smaller notecards, with unassuming, "quieter" handwriting. Instead, the co-starring couple took an air of pride, superiority, and a sardonic tone, rather than aggression. The couple's signs included links to the Youth Mentoring Connection, a nonprofit that provides work-site and community mentoring for teens, and Autism Speaks (editor’s note: an agency steeped in controversy), an advocacy organization that sponsors autism research, awareness and outreach. Gilda’s Club and Worldwide Orphans Foundation support those living with cancer, and provide healthcare and education to orphaned children, respectively. Both Spider-man stars are actively involved in these social causes themselves. Emma is an ambassador for Gilda’s Club, and Andrew is the same for Worldwide Orphans Foundation. Both Emma and Andrew understand that “with great power there must also come great responsibility.” But while Emma and Andrew’s statement was unquestionably altruistic and noble, the light shined brightly on them. Ironically, it’s not the charitable messages trending right now, but instead the adorable and open-handed nature of their relationship. The precious pictures of the two walking side-by-side, while defiantly holding their signs is a tender scene, to be sure. But I found myself enviously checking out Emma’s dainty spring outfit of a black blazer, shorts, and sunbonnet, alongside Andrew’s chic beret and color-coordinating gray shirt. I focused instead on the two as celebrities, dressed in style and making a scene, rather than actually reading the signs promoting the charities held in front of them.